Former NASA astronaut Frank Culbertson has the distinction of being the only American not on the planet when the 9/11 terrorist attacks occurred 13 years ago. Culbertson was about 250 miles (400 kilometers) above Earth — inside the still-under-construction International Space Station with two Russian cosmonauts — when he saw the huge column of smoke streaming from Lower Manhattan where the Twin Towers fell. 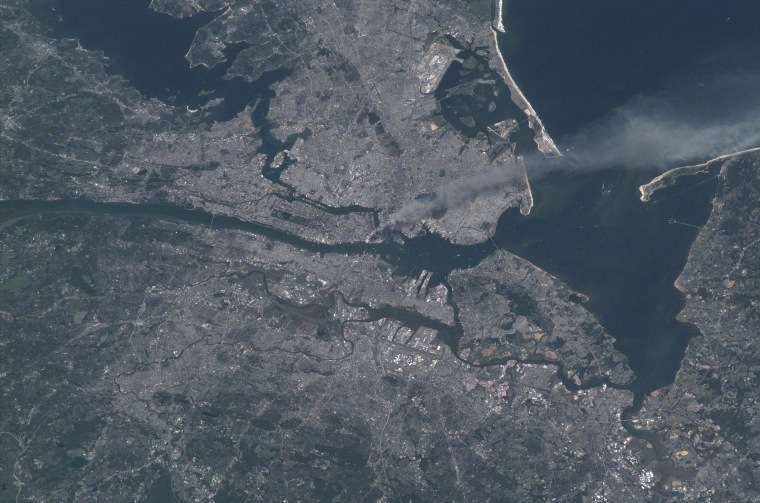 Culbertson captured video and photos of the 9/11 site from space for NASA, while satellites also tracked the attack site from orbit. Now, on the 13th anniversary of Sept. 11, 2001, the former astronaut is reflecting on that day. In a new video from NASA's Kennedy Space Center Visitors Complex Culbertson describes his call to the ground that morning, just a month into his stay aboard the station, to give the results of some physical exams to his flight surgeon at Mission Control Houston, Steve Hart. "Frank, we're not having a very good day down here on Earth," Hart told him. At the time, the astronauts did not have live TV or Internet at the space station. But Culbertson saw on the astronauts' map that the orbiting outpost was over southern Canada and about to pass over New England. He grabbed a camera and moved to a window in the Russian portion of the space station, where he had a clear view of the dark smoke over New York. Later, Culbertson could see the gash in the side of the Pentagon. He learned that day that his good friend and U.S. Naval Academy classmate Charles "Chic" Burlingame was the pilot of American Airlines Flight 77, which was hijacked and struck the Pentagon. "Every orbit we kept trying to see more of what was happening," Culbertson said. "One of the most startling effects was that within about two orbits, all of the contrails that are normally crisscrossing the United States has disappeared because they had grounded all the airplanes and there was nobody else flying in U.S. airspace — except for one airplane that was leaving a contrail from the central U.S. toward Washington, and that was Air Force One headed back to D.C. with President Bush. It was a very sobering time for us." A former test pilot, Culbertson was selected as a NASA astronaut candidate in 1984. Over three space shuttle missions, he logged 146 days in space before leaving the space agency. He is now executive vice president of Orbital Sciences Corp.